The feng shui dragon is a powerful and auspicious traditional feng shui cure and a symbol of strong yang/male energy. Dragons are very easy to use around the home or office and can bring support and nourishment to most rooms, but there are a few areas and placements to avoid. The Feng Shui dragon, or Chinese dragon, is very different from the evil, winged, fire-breathing reptiles of Western lore. Chinese dragons are exuberant, playful, beneficent creatures that live on land as well as in water and in the air. They are associated with spring rains and water and are symbols of abundant life, strength, fertility, and prosperity. Chinese dragons do not have wings but can float or undulate through the air. 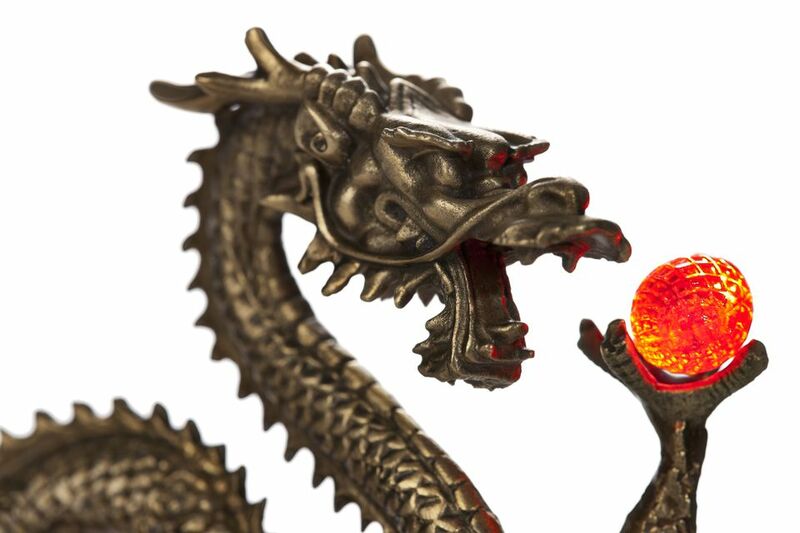 Some dragon figures are depicted with a pearl or crystal in their claws, symbolizing wealth, power, and opportunity. Used properly and respectfully, a feng shui dragon can help activate any of these energies in your home or office. Feng shui dragons come in many forms, including carvings and figurines, framed prints and paintings, tapestries, and carpets. They also come in many colors, symbolizing different strengths. The feng shui colors of water (black, dark blue, dark green) and the colors of money (gold, green) symbolize wealth and prosperity. Another common color for dragons is red, symbolizing energy or vitality. A framed print or painting of a dragon should be metal, the element that nourishes water. Conversely, frames made of wood tend to limit a dragon's energy because wood draws from water to grow. Figures of dragons may be wood, metal, stone, crystal, or ceramic. Each of these is suitable but has a preferred placement in the home. There are several ways to determine the best feng shui location and positioning of dragons in your home. One method is to make your choice based on your feng shui lucky directions, placing the dragon so that it faces one of your lucky directions. Another option is to choose the location of the feng shui wealth star for the current year. Bedroom: You can place a dragon in a bedroom or in your love & relationships feng shui area if you pair it up with the feng shui symbol of the phoenix; the dragon and phoenix pairing is the ultimate symbol of marital bliss. Placing a dragon alone in a bedroom creates too much yang energy and can disturb sleep. Office: Place a dragon on the wall behind your desk or desk chair, where the dragon provides support for you in your work. Placing a dragon in front of your desk creates opposition between you and the dragon. Kitchen: Dragons facing the sink—the source of water—strengthen water's benefits of wealth, prosperity, and opportunity. Placing dragons near fountains or other water sources (other than in the bathroom) has a similar effect. East bagua area: East is the home of the dragon and is the home of the wood element, making this a good location for a wooden dragon figure. Southwest or Northeast bagua areas: These areas are home to the Earth element and are particularly suitable for stone, crystal, or ceramic dragons that strengthen Earth. Dragons are powerful cures that can enhance most areas of your home, but there are a few restrictions surrounding their use. Like many feng shui cures, dragons can have the reverse of the desired effect if not used wisely or respectfully. Do not place a feng shui dragon in lower-energy areas, such as the bathroom, closets, or the garage. Avoid having too many dragons in your home. The maximum recommended number of dragons in the entire home is five. Interestingly, placing three dragons in the same area can encourage the trio to interact mischievously or unproductively, so try to avoid grouping them in threes. Don't place dragons higher than eye level. Do not have your feng shui dragon face a wall or place the dragon in a cramped or restricted corner of your room. Avoid having the pearl in the dragon's claw facing toward a window or door. Do not place dragon images on the floor, even if the dragon is part of a carpet. Dragons should not be walked on.